This section is meant to help users on well-supported platforms and common Python environments get started using Chaco as quickly as possible. Chaco users can subscribe to the enthought-dev mailing list to post questions, consult archives, and share tips. There are several ways to get Chaco. The easiest way is through the Enthought Python Distribution (EPD), which is available for several platforms and also provides many other useful packages. Chaco may also be available through a package manager on your platform, such as apt on Ubuntu or MacPorts on OS X. You can also build Chaco yourself, but because of the number of packages required, we highly recommend you install EPD. Either wxPython or PyQt to display interactive plots. As an alternative to PyQt, Chaco is being tested more and more with the PySide toolkit (LGPL license). Chaco, the rest of the Enthought Tool Suite, and a lot more are bundled with EPD. Getting EPD allows you to install Chaco and all its dependencies at once; however, these packages will be linked to a new instance of Python. The EPD Free distribution is free for all users and contains all that you need to use Chaco. To get EPD, go to the EPD download page and get the appropriate version for your platform. After running the installer, you will have a working version of Chaco and several examples. Building Chaco on your machine requires you to build Chaco and each of its dependencies, but it has the advantage of installing Chaco on top of the Python instance you already have installed. The build process may be challenging and will require you to have SWIG, Cython and several development libraries installed. Or, download the source from the Chaco GitHub repository or alternatively as a part of ETS. Chaco ships with several examples for testing your installation and to show you what Chaco can do. Almost all of the examples are stand-alone files that you can run individually, from any location. Depending on how you installed Chaco, you may or may not have the examples already. On Windows, they are in the Examples\ subdirectory of your installation location. This is typically C:\Python27\Examples\Chaco-<version>. On MS Windows these examples can be browsed from the start menu, by clicking Start ‣ Applications ‣ Enthought ‣ Examples. On Linux, they are in the Examples/Chaco-<version> subdirectory of your installation location. On Mac OS X, they are in the /Applications/Enthought/Examples/chaco-<version> directory. If you downloaded and installed Chaco from source (from GitHub or via the PyPI tar.gz file), the examples are located in the examples/ subdirectory inside the root of the Chaco source tree, next to docs/ and the enthought/ directories. Chaco examples can be found in the examples/demo/ and examples/tutorials/ directories. Some are classified by themes and located in separate directories. Almost all of the Chaco examples are standalone files that can be run individually. We will first show how to execute them from the command line, and then we will show how to run Chaco in an interactive way from IPython. 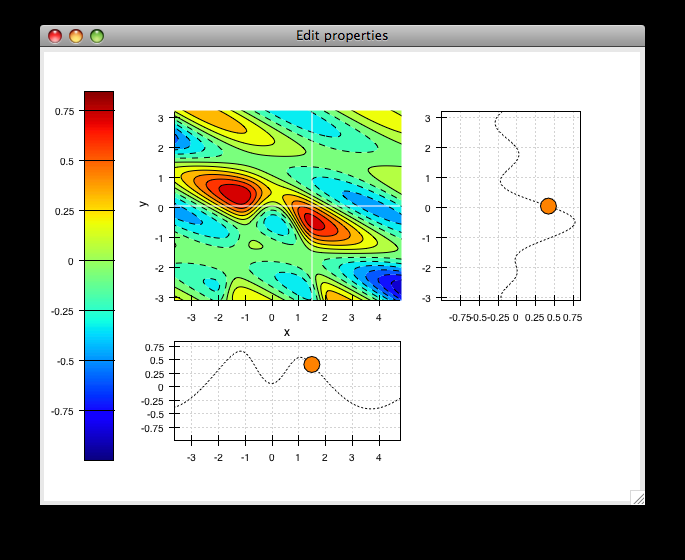 This “shell” mode will be more familiar to Matplotlib or Matlab users. Some of these examples can be visualized in our Chaco gallery. 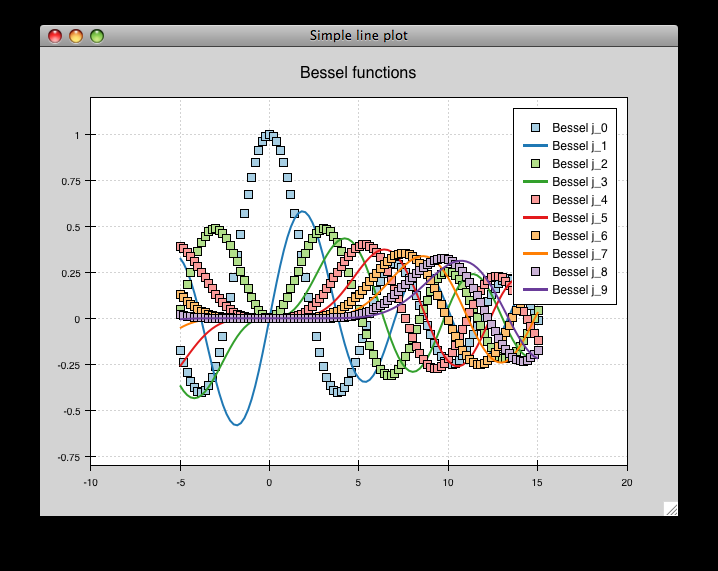 This opens a plot of several Bessel functions with a legend. 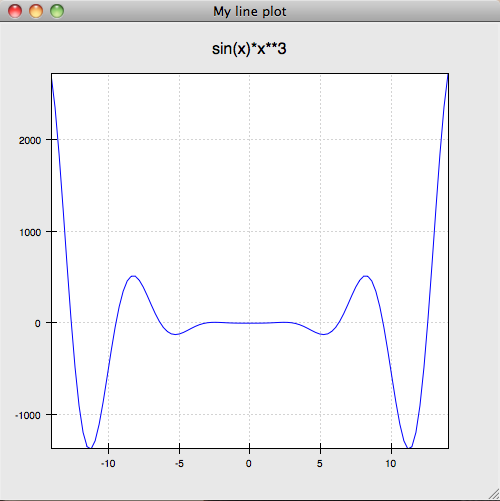 You can interact with the plot in several ways: .. Ctrl-Left and Ctrl-Right don’t work in OS X? To pan the plot, hold down the left mouse button inside the plot area (but not on the legend) and drag the mouse. Mouse wheel: scroll up to zoom in, and scroll down to zoom out (or the reverse you’re on a version of OS X with ‘natural scrolling’). Zoom box: Press z, and then draw a box region to zoom in on. (There is no box-based zoom out.) Press Ctrl-Left and Ctrl-Right to go back and forward in your zoom box history. Drag: hold down the right mouse button and drag the mouse up or down. Up zooms in, and down zooms out. For any of the above, press Escape to reset the zoom to the original view. To move the legend, hold down the right mouse button inside the legend and drag it around. Note that you can move the legend outside of the plot area. To exit the plot, click the “close window” button on the window frame or (on Mac) choose the Quit option on the Python menu. Alternatively, can you press Ctrl-C in the terminal. spectrum.py requires that you have PyAudio installed and a working microphone. data_cube.py needs to download about 7.3mb of data from the Internet the first time it is executed, so you must have a working Internet connection. Once the data is downloaded, you can save it so you can run the example offline in the future. For detailed information about each built-in example, see the Annotated Examples section. While all of the Chaco examples can be launched from the command line using the standard Python interpreter, if you have IPython installed, you can poke around them in a more interactive fashion. 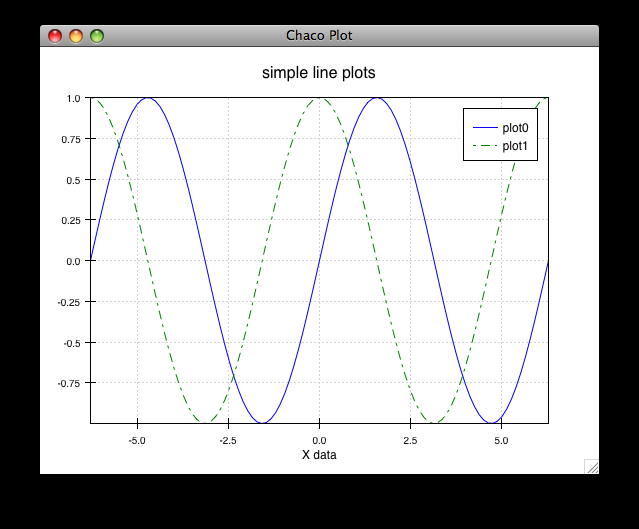 Chaco provides a subpackage, currently named the “Chaco Shell”, for doing command-line plotting like Matlab or Matplotlib. The examples in the examples/demo/shell/ directory use this subpackage, and they are particularly amenable to exploration with IPython. This shows two overlapping line plots. You can interact with this plot just as in the previous section. This displays the plot window, but gives you another IPython prompt. 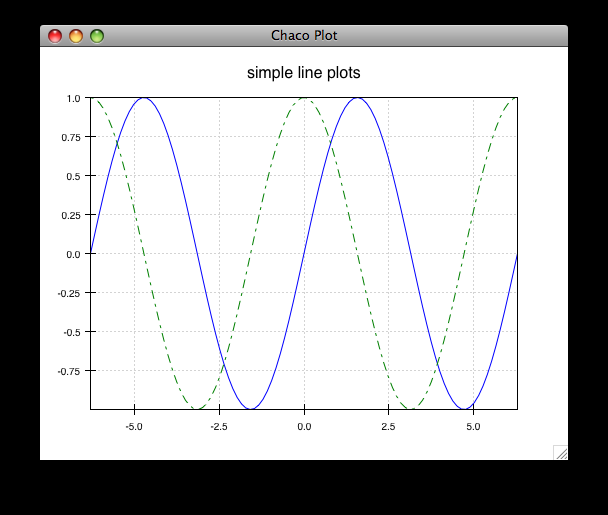 You can now use various commands from the chaco.shell package to interact with the plot. The chaco_commands() function display a list of commands with brief descriptions. You can explore the Chaco object hierarchy, as well. The chaco.shell commands are just convenience functions that wrap a rich object hierarchy that comprise the actual plot. See the Exploring Chaco with IPython section for information on all you can do with Chaco from within IPython. Let’s create, from scratch, the simplest possible Chaco plot (embedded inside a Traits application). This might look like a lot of code to visualize a function, but this is a relatively simple basis on top of which we can build full-featured applications with custom UIs and custom tools. For example, the Traits object allows you to create controls for your plot at a very high level, add these controls to the UI with very little work, and add listeners to update the plot when the data changes. Chaco also allows you to create tools to interact with the plot and overlays that make these tools intuitive and visually appealing. As part of the Enthought Tool Suite, Chaco is free and open source under the BSD license.